Hair transplant are critical. A lot of people consider hair transplant once in their lifetime because of the perpetual hair loss and balding. Some people out of the few actually go for the procedure while the others believe in the rampant myths and forgo the idea. The problem is not really the myth but lack of knowledge. Therefore, it becomes quite necessary to gain proper knowledge about a particular procedure or technique before arriving at a conclusion. 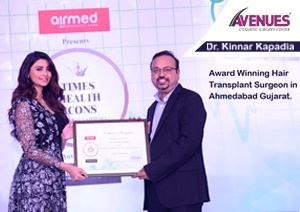 Over the years, hair transplant in ahmedabad has been a talk in the town and so there are many myths related with the procedure. This article is solely dedicated on resolving such prevalent myths and giving you a better insight into the technique. Shaving your head frequently will lead to better hair growth. Shaving your head has nothing to do with hair growth. A lot of people suggest shaving off head in order to grow more hair on the scalp. However, none of it has been proved scientifically. Hair growth is rather much related to genetics than shaving one’s head. 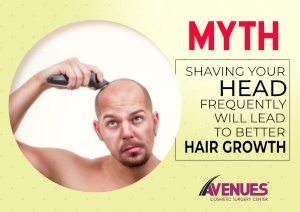 The hair follicles responsible for hair growth are deep into the scalp tissues which are unaffected by shaving. If you are suffering from hair loss then you should better visit a dermatologist than shaving your head frequently. The hair which are transplanted on to the scalp are ACTUAL hair. The hair are basically extracted either from the back of the head or other regions of the body and transplanted on to scalp. The procedure is carried out in such a way that you cannot differentiate between your original hair and transplanted hair. It is more or less same as the organ transplantation. Thus, the transplanted hair are natural and are not man-made. The natural hair are bound to grow in the regular manner irrespective of the transplantation. 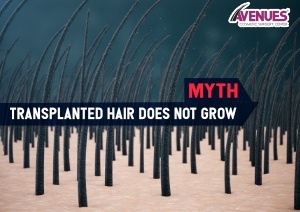 This myth is somewhat true and generally people of all age groups ranging from 20’s to 70’s can consider hair transplant depending on their indications. However, people beyond the age of 30-40 are considered ideal for the procedure. People in this age group have a stabilized hair loss pattern and are unlikely to lose more hair than their regular hair loss pattern. This makes the task of the Doctor a tad easier because he can easily identify the donor area suitable for hair transplant. 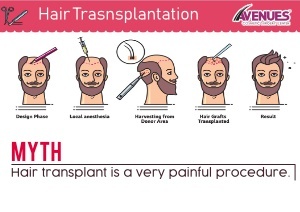 Hair transplant is a very painful procedure. Hair transplant just like I said is somewhat similar to organ transplant and every transplantation procedure is carried out under anaesthesia. And so, the patient does not feel any kind of pain or discomfort. Hair transplant is carried out by giving a local anaesthetic to the patient which numbs a particular area of their body. The patient is thus awake during the procedure and might feel odd because of a specific mindset but watching a movie or reading a book while the procedure can distract the mind of the patient up to a certain level but pain is never an issue with hair transplants. The results are same irrespective of the surgeon. This does not hold true because the results are entirely dependent on the knowledge, skill and experience of your surgeon. If you choose to consult a surgeon with little or no experience then there are high chances of getting infections while a reputed clinic or surgeon protects you from the unfavourable situations. Therefore, it is imperative to opt for a reputed clinic and surgeon to achieve best results.